Some people find that giving their thoughts and opinions comes easily and naturally, while others struggle to feel so open. Some might be afraid of what their opinions might stir up and so they want to avoid causing this drama. 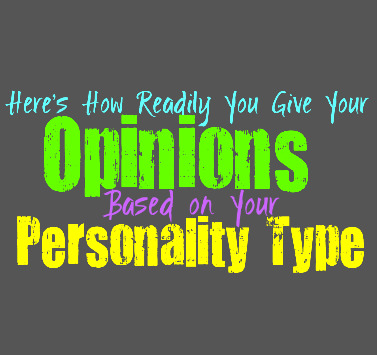 Here is how readily you give your opinions to others, based on your personality type. INFJs can sometimes avoid expressing their opinions too openly, since they don’t feel comfortable sharing with everyone. Sometimes the INFJ will keep certain opinions to themselves not wanting to get into it with some people. INFJs do have certain opinions that they need to stand up for, especially when it is something deeply important to them. It is more about choosing their battles and knowing when they need to stand up and when they prefer to keep things to themselves. ENFJs are rarely afraid of giving their opinions, and often prefer to live this way. ENFJs aren’t likely to hold back when it comes to speaking their mind, especially when it is important to them. They often try to speak to people in a compassionate and understanding manner, which helps them when they are giving their opinions. They can often speak with a sense of tact, even with the more challenging opinions. ENFJs know how to express themselves without upsetting people, and this helps them share their opinions. INFPs will readily give their opinions when it is something important to them. INFPs sometimes keep things to themselves when they are around people they cannot trust, not wanting to stir up drama. For them it is about choosing their battles and knowing when to speak their mind. When the INFP has something that matters deeply to them, they will not be afraid of giving their opinions and expressing themselves to the people around them. ENFPs definitely give their opinions rather readily, unafraid of expressing themselves. They don’t like having to hold things back and don’t want to refrain from expressing themselves. When the ENFP feels deeply about something they don’t want to have to keep things quiet. They give their opinions when they truly matter to them, and don’t feel the need to hide from others. ENFPs are open and honest people, with a sense of morals that often forces them to give their opinions about what matters. INTJs definitely give their opinions readily, especially when they need to spread the truth. INTJs aren’t afraid of saying what is on their mind, and they will do this with a sense of focus and precision. They can be a bit direct sometimes and might upset people with their opinions, but they aren’t really concerned with this. They simply want to spread the truth and make sure to correct any inaccurate information. Often the INTJs personal opinions are rooted in facts, and this is why they do what they can to express this openly. ENTJs give their opinions rather readily, and don’t like being held back in any way. When they feel like they need to express something they aren’t likely to hold back in order to spare someone else. ENTJs share their opinions and beliefs in a rather direct and factual manner. They can sometimes lack tact when they are sharing their opinions, but this is simply because that is the only way they know how to express themselves. INTPs sometimes try to refrain from expressing their opinions to some people, not wanting to be that open. INTPs do however believe in being direct and precise, and sometimes they will correct other people’s mistakes. INTPs just don’t always feel the need to share their deeper opinions, wanting to reserve them for the people they can actually trust to understand. INTPs realize that most of their inner thoughts can be difficult for most to truly understand, and so they don’t always readily share them. ENTPs definitely aren’t afraid of expressing their opinions openly, and they will certainly do so. ENTPs are upfront people who like to give their opinions and their thoughts in a way that can shake things up. While some people are afraid of readily giving their opinions because of the trouble it might cause, ENTPs often enjoy seeing the reactions and being able to understand people better because of it. ISTJs will give their opinions when it is important to them, and only in those situations. They don’t just open their mouths without it being valuable information that they want to share. When the ISTJ beliefs that their opinions need to be share, then they will not be afraid to be honest. ISTJs are themselves and don’t like having to pretend or hide this. They are somewhat private people but what they do share is completely honest and sincere. ESTJs definitely give their opinions readily and don’t like holding things in. If they feel strongly about something they will definitely express their opinions without reservation. ESTJs can sometimes be a bit tactless when they are expressing their point of view to others. They do whatever they can to convey what matters to them, especially when they are working towards accomplishing their goals. ISFJs don’t often readily give their opinions, especially if they think it will cause drama. They want to maintain a sense of harmony in their environment and will do whatever it takes. ISFJs sometimes keep things to themselves when they know that it might upset people, and only want to share with the ones they can trust. ISFJs are private people and most of the time they would rather have space when it comes to sharing their inner thoughts and beliefs. ESFJs sometimes refrain from readily giving their opinions because it can cause drama. If their thoughts and feelings are likely to make enemies then the ESFJ will definitely keep these to themselves. ESFJs can be good at speaking in a tactful manner though, and often they can water down their opinions in order to share them. They don’t always feel the need to share though, especially when they know that it will not be received well. ISTPs definitely give their opinions when it they matter, but not when it doesn’t. ISTPs can be private people and they don’t always feel the need to share their thoughts and opinions with others. They are more likely to step in and express themselves when they are spreading the facts and trying to inform others. ISTPs simply want to focus on what feels right for them, and they don’t always feel the need to share their opinions with others. ESTPs do give their opinions rather openly and readily, especially with the things that matter to them. ESTPs want to spread the truth and when they believe in something they want to share this. They aren’t afraid of stirring things up if they believe it is the right thing to do. ESTPs give their opinions when it matters and when they believe in what they are saying. ISFPs definitely give their opinions readily when it is something that matters to them. ISFPs have strong inner morals and opinions and they believe in expressing them when it matters. While they want to be open and honest, they are also someone internal people. ISFPs don’t feel the need to shove their opinions down other people’s throats, but they do need to stand up for the things that truly matter to them. ESFPs definitely give their opinions readily and openly and don’t like holding back. ESFPs are themselves without reservation and they enjoy expressing themselves. They aren’t afraid of speaking their minds, even if that challenges some people. While ESFPs do like making friends and connections, they also want to be themselves openly. When the ESFP feels strongly about something they will definitely give their opinions.